I used a Spectral preamp and power amp on Sonus Faber Extremas here in the UK and when I wanted to move my active Apogee Divas back here when I left France in 1995 I wanted to use 2 Spectrals instead of the massively electricity guzzling Krell KSA 200Bs I used there. I wrote to Spectral about driving ribbons but just got a rude reply saying they disapproved of active speakers so rather than buying another Spectral I sold the lot and bought a Goldmund preamp, monoblocks and speakers. Still got them. Don't know which Goldmund you have. I repaired one of the Mimesis models from around that time once. One of the middle inputs had become noisy and if left on a few hours quit altogether. Goldmund had each input using its own TO92 transistor. They were using a high bandwidth capable version. The noisy input had its TO92 just beneath a ribbon cable. They were running something like 400 milliwatts on this TO92 rated for 500 milliwatts. I thought that a poor design decision. I'd like to see 50% or less of rated power on such devices. With restricted ventilation that one had cooked. Fortunately the maker of that little transistor had come out with an exact replacement only with 1000 milliwatts dissipation rating. It was a slightly odd bird and I had to order it at the local electronics supply house. I explained all this to the owner after I fixed it. Told him about having to special order and that the upgraded part I thought was the smart move, but this part cost a little more than twice the original part. I told him this in a serious tone, and he was looking like, "oh my, how much is this costing me". Then I told him the new part was nearly $2. He was much relieved. Because of their wide bandwidth, Spectral amplifiers can amplify high frequency signals in the MHz range at massive power levels. Therefore radio frequency noise must be kept out of the amplifier. The MIT interconnects contain RF protection, and Spectral preamplifiers are stable at these high frequencies. 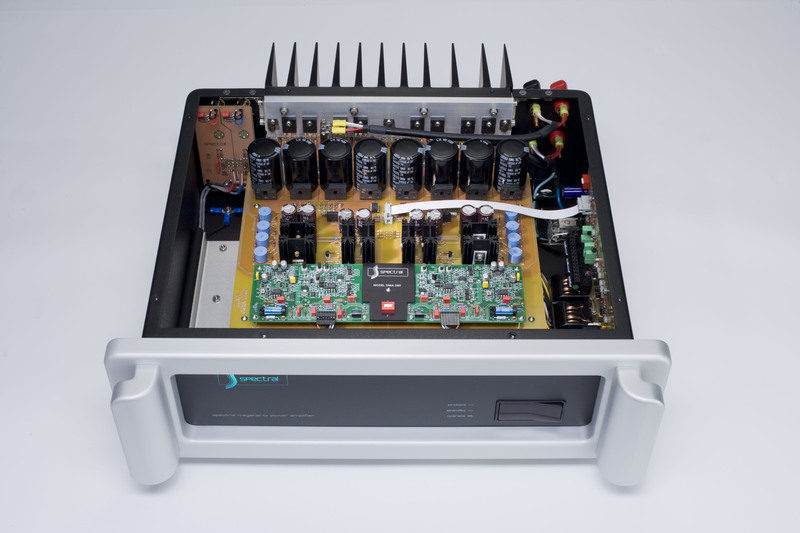 Unlike most all solid state preamps, Spectral preamplifiers are true discrete designs, are DC coupled, and can output the high current that the (non-Universal) Spectral power amps are designed to be driven by. Other brands of preamplifiers often use integrated circuits or other devices which may not be able to drive the amplifier properly. It is interesting to know that IC's (integrated circuits) simply cannot provide for high current output in a preamp design which utilizes them. Whereas a fully discrete Spectral preamp—fully discrete meaning no IC's in the signal path—can provide on the order of 1 ampere of output current per channel! What will happen if you don't follow these guidelines? Well, it's a probability thing. You may not encounter any problems—or you may encounter premature failure of some components in the amplifier. Or (worst case) your amplifier may suffer severe RF problems, and you will have to pay to have all the output devices replaced (which is expensive). Therefore, we highly recommend that you follow Spectral's operational and warranty guidelines for both peace of mind as well as highest performance and fidelity." When I owned Spectral gear I remember the warning about using anything other than the approved MIT cable could void warranty in the manual. The dealer also made that point clear. My takeaway: use the MIT cables, if not, any damage that may be caused by not following Spectral's guidelines was on me. Well they weren't quite that adamant about it back some years. Seems a waste to have 2 mhz bandwidth and then use a low bandwidth cable all the way. I understand some of why they say they prefer this (beyond just warranty safety), but it is a dumb idea in my opinion. Don't know which Goldmund you have. I repaired one of the Mimesis models from around that time once. Goldmund called all their amplifier components Mimesis plus a number for a number of years. When I first came upon them the top stereo amp was a Mimesis 9 top mono amp the Mimesis 9.4 and top preamp a Mimesis 2. The UK importer stopped selling them, rumour had it that Krell, a much bigger brand he also imported, didn't like the competition. When I was living in France I bought the Golmund Europe distributors demo Goldmund Reference turntable when they discontinued it and got to know him a bit. Quite some years later, having used Krell and Spectral electronics for years, I came across the Goldmund electronics and speakers at his place when I went to listen to the, much hyped, Wilson Audio WAMM which he was selling used for a client. I was slightly underwhelmed by them and took the opportunity to listen to his demo Goldmund speakers that day. I was impressed and eventually bought some, around that time Goldmund bought Job to obtain the intellectual property of their amp circuit. As I understand it they brought out a new range of amplifiers using this circuit and preamps by adding a 2 after the Mimesis name, so the new top preamp was the Mimesis 22 and the top stereo amp the 29. These were complete redesigns with a much more elaborate and bigger case as well as the new circuit. These products had several updates and I believe the latest version of the Mimesis 22 is still their top analogue preamp but they really went digital active a very long time ago and their analogue amps are a bit of an outlier. They changed the amp circuit again a few years later and changed the name of the power amps from Mimesis to Telos. They also have a slightly less expensive range called Metis with simpler case and power supply and the mail order only Job range in a still simpler less expensive case and power supply. Since they are not easy to sell I still have the Mimesis 22 and a pair of Mimesis 29.4 monos, and the Mimesis Ph2 phono stage. The amps weigh 75kg each so I can barely move them. @Blumlein 88, thanks for the details. Makes sense. They've gone further and load the amplifier with a simulated loudspeaker load instead of just resistance. Seems silly not to do this, at least for amps that test as transparent on a resistor bank. Extremely low M1 and M2 harmonics, to bad the hum noise is around -90dB. Does the 50/100/150Hz hum becomes audible, like here, with high volume (between tracks or no music on inputs)? Picture from manufacturer's website. Notice the perfect layout arrangement, ground, star ground on the audio inputs, huge caps, clean and airy PCB layout. I totally love the way it looks inside. Usually, mains hum is induced from the transformer or PSU. However, worth reading one paragraph from http://www.spectralaudio.com/dma-260.htm, although I've no idea where the transformer is located, so I guess it's SMPS inside...or not? Here's a similar amp: http://www.spectralaudio.com/DMA300/DMA300 Top Open.gif. The Focused Power output section of the DMA-260 is only one of the many Spectral innovations designed to create the ultimate in amplifier control and resolution. A unique transformer architecture supports the critical requirements for lowest noise and high power capability of the powered output section array. In traditional high-end power amplifiers, output transformers are located away from active amplifier circuitry for purposes of noise isolation and construction ease. This virtually universal method extracts a significant sonic price, however, because of the speed and regulation losses which are imposed by the long power supply wiring harness. In addition, the EMI and noise which radiate from the supply harness invariably contaminate sensitive low level circuitry by noise modulating the musical signal. Spectral engineers have long recognized the problems associated with power supply noise contamination and have proposed a unique solution in the DMA-260 High Resolution Amplifier. The Power Vault electromagnetic field containment system virtually eliminates EMI radiation to the amplifier signal path circuitry as well as power and regulation losses through the traditional power supply harness. The architecture starts with Spectral's elaborate high performance custom power supply transformers. These unique designs are the result of years of research and development to maximize isolation and regulation. Each transformer features individually isolated windings to support each individual output transistor in the amplifier output section, a premium technique shared only with the Spectral DMA-360 Monaural Amplifier. The twin power transformers are mounted between massive machined mounting plates for damping and resonance control. The combined 38 lb. transformer structure is then mounted on a constrained rubber floating suspension system employing multiple compliances similar to a fine turntable suspension. The finished transformer assembly is then suspended inside an EMI, RFI tight welded aluminum containment box located directly beneath the DMA-260 output section. The resulting transformer Power Vault containment system results in an uncompromising solution to the universal power supply noise problem. The high-current power transformers are now intimately sited next to their own high-current output devices with extraordinary noise isolation. The high-speed driver circuitry of the DMA-260 operates in a pristine environment free of the noise radiation and phantom signals which plague other power amplifiers. Dynamic range limitations are removed with a sonic clarity and quietude which is palpable."